MHT-CET is the doorway to enter the professional Courses. Unlike the board exams, this exam is given in one day. 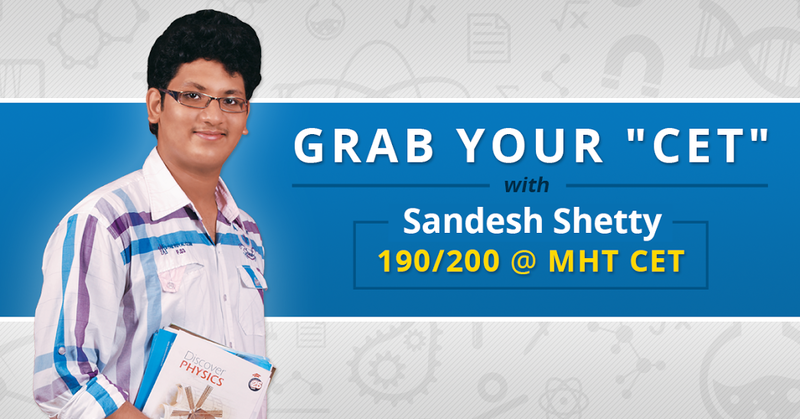 MHT-CET is the most important exam for students aspiring to become doctors and engineers in Maharashtra. Getting expert guidance and mentoring at this stage is Critical to getting admission into your dream college. And you can get this expert guidance and mentoring from the distinguished faculty of MT Educare (formerly Mahesh Tutorials) Prof. Chintan Parekh and Dr. Surendra Singh sitting right in your home. Along with Topper Sandesh Shetty (190/200 at MHTCET), the faculty will explore the journey to cracking MHT-CET including. The webinar is scheduled on 30th March between 6 pm to 6.45 pm. So go ahead and Grab your CET by registering here for Free! Bonus Tip: If you have read so far, here is an added Bonus. You can ask any doubts and questions to be addressed by the panelists during the webinar, right now. Just ask the question when completing the registration process and we will try our best to address them during the webinar. Ok so it actually goes with chain rule. For given differential dy/dx can be considered as product of two or minimum two separate differentials. This particular approach will allow you to solve some good problems of differentials done. Say if Y = sin (x ^2). Find dy/dx. our problem would have been easy it would have been cos x of sin x. Then what to do? What will be our planning? Now listen carefully. Kids, let’s see the next module, explain the various levels of management. Now, management exists everywhere, remember. It’s universal. Management is required in every organisation. Size of the organisation may not be the same. Some are small, some are medium and some are large. So, style of management for different scale is different. Management of small organisation is simple and the management of a grocery shop is also simple so, than management of the bank or a car manufacturing company. So, in a large scale organisation management is complicated. So, therefore it is done by making different parts, all levels of in the organisation. Now, levels are made according to the size and requirement of the organisation. So, usually there are three levels, do remember, right. Three levels of management, top level, middle level and the lower level that is supervisory level. You can see in front of you, a pyramid, top level, middle level and the lower level, right. Now, who works at the top level? Let’s see, board of directors, right, managing director, CEO that is Chief Executive Officer. Now, what work they do at this level, let’s understand. So all these people work at top level, we decide the objectives and goals of the organisation, we frame the plans and the policies to achieve these objectives, we see that the policies are properly implemented, we create various positions to do different activities, we also appoint leaders, right, at the middle level of management and give them directions to carry out different, different activities, we evaluate, we check the performance of various other different departments at the middle level. Now, let’s check middle level. Herein, correct, who works, right, head of the finance department, head of IT department, head of HR department. Now, what work they do? Let’s check, we link, right, they are connecting link between the top level and the lower level of management. They understand the policies of the top level, top level whatever the policies they make, middle level understand and they make it more simple so that the lower level again understands. We decide the plan of action in the department to achieve the targets given. We assign specific duties to the staff in the department. We help top management to coordinate the activities of various departments. We train people from the department to carry out the different activities in the future. We appoint lower or supervisory level staff. So, now we come to the lower level that is supervisory level. Now, what these people are? Let’s see who are they? They are supervisor, they are foreman and superintendent, right, kids. Now what work they do? Let’s check, we get the instructions from the middle level, right, and they follow them accordingly. We assign the works to subordinates. We give instructions and direct subordinates to complete the task or the job. We guide them, right, wherever it’s required or necessary. We look after the maintenance of machinery, equipment and tools. We solve the problems and settle the disputes among the subordinates, right, disputes or some misunderstandings. We conduct quality check of the product or service from time to time. Hi, kids, we are going to start with chapter 4 of secretarial practice, formation of joint stock company, one big joint or business organisation, right, let’s see. We are going to start with the first module, explain in brief public limited and private limited companies. Now here you can see we have two types, private limited companies and public limited companies, right. Please watch it carefully. It is necessary to have the word private in private, nothing of the type in public, only simple, you are going to write the name of the company that’s all. Private company means let’s check: According to Companies Act, 1956, Section 3(1)(iii) a private company is one which by its articles restricts the rights to transfer it shares. That means you cannot freely transfer, you cannot sell shares easily. Limits the number of its members to 50, you can see private limited company maximum number of persons or members is 50. Prohibits any invitation to the public to subscribe that is to buy for any shares in order or maybe debentures of the company. And prohibits any invitation or acceptance of deposits from person other than its members, directors or their relatives. What does that mean? They can only take money from their near and dear ones and their own members, not from the public. Right, kids, do remember, now private company is a kind of a joint stock company. Those who want to establish a joint stock company, keep its businesses limited, usually register the company as private limited company, right. Restricted to few number of members. Now private company collects capital privately, minimum 2 members and maximum 50. Remember that company we call it as a private limited company. It cannot collect capital by inviting general public to purchase the shares of the company, neither its shareholders can transfer their shares freely. Freely means without taking any permission from directors. In short private company performs operations in restricted manner. A private company has to add words called as ‘private limited’ at the end of its name. You can check the example given, right, on your left hand side, MT Educare Private Limited. Public company means, let’s check, according Companies Act, 1956, Sec 3 (1) (iv) public company means a company which is not a private company, it is so simple and easy to remember. Which is private is not public and which is public is not private. Now there are no restrictions on transfer of shares, that is shares are freely transferable. You just need to take permission from directors. There is no limit on maximum number of membership, it means the maximum number can be unlimited. There is no prohibition to any invitation to the public to subscribe for any shares or debentures of the company. Means what, they can collect money, money, money from public, right, by means of shares or debentures. Prohibition – restriction. There is no prohibition again for acceptance of deposits from persons, thus public company can accept public deposits. A public company has to add the word ‘limited’ at the end of its name. Do remember, right kids, at the top you can see, MT Educare Limited. And membership is minimum 7, maximum no limit. Kids, we will move to the next module. Discuss the concept of Partnership Firm and state its features. Means we will see about partnership, more than two people. Right, coming together to do business, you can see in the following picture. Now, partnership is started by an agreement between persons. Now, two or more persons come together and have sharing in profit, as per the profit sharing ratio. Right, they sign in an agreement, where terms and conditions are mentioned. This agreement maybe oral or maybe a written one. And kids, always written agreement is better, right, it acts like an evidence, yes. Minimum two persons are required to start this partnership firm and the maximum number is 20, in case of general business and in case of banking there are only 10. Do remember, right, minimum number of people 2, maximum banking is 10 and non-banking is 20. Now, let’s see third feature, partnership firm is started to carry on a business activity. Let’s check an example alongside, raw material is collected then some processing done, right, cutting, shaping, polishing and what do we get, finished goods, wooden table and chairs and many more articles. So, partnership business is carried out for all these business activities. Now, the ownership of partnership firm is joint, remember that 2 or more than 2 people that is partners are joint owner of assets and liabilities of business, right. All this property belongs to all the partners in the firm. All the debt also belongs to all the partners in the firm. The partners manage business jointly, everything will be done together, it means all the decisions are taken by mutual consultation means after taking permission or consulting each other. Right, you can see there, they are consulting each other, we are going to start something new, we are going to start something different. The profit and loss are shared in the decided proportion or as per the agreement, agreement or deed you can call it as, any legal instrument in writing that is signed or attested by all the partners. The liability of the partners is unlimited, joint and several. Very, very important kids, do remember and understand very well. Now let’s take an example four partners in a firm, right. We name it as A, B, C, D and what is outstanding? Rs. 1 lakh. Now, jointly what you can see here. Jointly, individually they are responsible to pay 25,000 each, correct kids. So, this is joint, do remember that. Now, let’s check severally, now what happens here, there are four partners. Now, one of them dead but still the outstanding amount is rupees one lakh. So, you can see the remaining three solvent partners sharing that one lakh into three equal parts. So, that is you can see there, three equal parts, right, kids. Another, what happens now, second condition, again for severally, one was dead, second partner is insolvent now. So, two remaining solvent partners will share one lakh into two equal parts, right. And finally again, if even the third partner becomes insane means mad, unsound mind, then the last partner, which is solvent will share or take the burden of every penny which is remaining outstanding, you can see one lakh outstanding entirely has been taken care or paid off by the solvent partner. So, kids, do remember, unlimited, joint and several, right, liability unlimited, I hope you remember that. No difference between personal assets and business assets and joint and severally we did just now. The share in partnership cannot be transferable to any other person without the consent of other partners. It means interest of partnership is non-transferable. As you can see here, these are the partners of Bajate Raho Firm. Now, Mr. Y wants his son to join the business. He needs to consult everyone and if everyone approves, he can bring in his son, right. So, Mr. R becomes the new partner in the business. Hi, friends let’s start with a fresh topic. The name of the topic is Depreciation. Let’s see what is that depreciation? fixed assets, examples – machinery, so machinery used in the business for production purpose. After that furniture, it is used in a business or factory. fixed assets decreased and the decrease is mainly because of use of fixed assets, so that reduction is called as depreciation. of fixed assets also goes on decreasing. And then after that, day by day the value of year will keep on decreasing when we are using it for a business. value of our fixed assets goes on decreasing and so that reduction is treated as loss to our business. Let’s go to next module, methods for calculation of depreciation. So, methods for calculation of depreciation means to determine the amount of depreciation, there are different methods. So let’s proceed further, before that we have to understand one more important term, that is Written Down Value abbreviated as WDV, very commonly abbreviated as WDV. So, what is that WDV? It is the value of assets in the books after deducting depreciation from the original cost of the asset. After deducting depreciation, we have seen depreciation is reduction, so when we deducted this depreciation, whatever is left that is called as WDV. See, further every year depreciation is charged with which reduces the book value of the asset. Because of charging depreciation its value goes on decreasing and that value we call as book value. So, book value goes on decreasing because of charging depreciation. Written Down Value goes on decreasing every year as depreciation is continuous reduction in the value of fixed assets. Depreciation is the continuous reduction every year, depreciation will be taking place and that will keep on decreasing the value of fixed assets. So that value after charging depreciation is Written Down Value. Let’s see here one illustration, original cost of the asset Rs. 1 lakh less depreciation, we are charging depreciation on this particular asset, just one hypothetical figure we have taken here depreciation is Rs. 20,000. That we are going to see how to calculate that, but at present to understand this WDV we have taken depreciation Rs. 20,000, that means the value of fixed asset decreased by 20,000 at the end of first year. Now, tell me, friends, what is the value of asset in our books, our books value is Rs. 80,000, and the original cost one lakh, depreciation charged, so now it is 80,000 at the end of first year or beginning of second year. Now, this 80,000, what do you call this, just now we saw that value after deducting depreciation from original cost is called as Written Down Value. So this is WDV. After that second year we use it, again we charge same amount of depreciation, I told you this is just hypothetical figure just to understand this particular WDV. So, again same depreciation charged 20,000 and now at the beginning of the third year the value of the asset is 60,000. So this is book value at the beginning of the third year because of depreciation it has decreased, again this is called as WDV. So, after charging depreciation whatever is left that is known as WDV. So third year again we charge depreciation of 20,000 and now the value is 40,000, this is called also WDV. So, from this as it will go on and so on every year we will charge depreciation, every year the value goes down and that value after charging depreciation is known as WDV. And so first year 80,000, second year 60,000 and third year 40,000, value of asset after deducting depreciation is Written Down Value, whereas, the original cost never changes. So, here the WDV goes on decreasing every year but the original cost will never change. The original cost remains constant. Then after that, let’s see further method for calculation of depreciation. Now, method, different methods are there for calculation of depreciation, number of methods are applied to calculate depreciation to be charged for the accounting period. Out of the various methods mentioned below, a suitable method is based on the nature, scope of business and concerned fixed assets as well as provision of the concerned act are adopted. So, now which method is to be followed that depends on nature of business, scope of business, after that nature of concerned fixed assets and obviously unavoidable that is the provision of laws applicable to that particular business. Now, the syllabus for FYJC prescribed first two methods only. So, out of the list of methods, two methods only are there in FYJC syllabus, remaining methods you will study in further standards. So, check first method Original Cost Method, second method Written Down Value Method, third is Annuity Method, fourth is Depreciation Method, after that Machine Hour Rate Method, after that Insurance Policy Method, Sum of years digit method, etc. Out of this only first two are applicable for the syllabus of FYJC, that is Original Cost Method and Written Down Value Method. So, let’s move to first method which is there as per our syllabus, Original Cost Method. Understand what is that, under this method, depreciation is calculated on the original cost of asset every year at a fixed rate of depreciation or by a fixed amount of depreciation. So, every year we will calculate depreciation on the original cost, of course when you have to calculate depreciation, if the rate of depreciation is given. So, that rate of depreciation remains constant and every year it will be applied to original cost or directly will be given the amount of depreciation. So, the same depreciation will be charged every year. Since, original cost is fixed, rate of depreciation is fixed, amount of depreciation every year is also fixed. Original cost is fixed, we have seen never changes, rate of depreciation is fixed and so, because of that amount of depreciation is also fixed. The amount of depreciation remains constant every year on a particular asset. So, it will remain constant, it will not change year by year. It is also called as Straight Line Method or Fixed Instalment Method, due to this reason as the amount of depreciation is fixed, that means the instalment of depreciation is fixed, it is also called as Fixed Instalment Method or Straight Line Method..
Hello, friends, myself Nitin Mahajan and going to introduce you this subject, which is all new subject for you. And name of the subject is Book-keeping and Accountancy. So, we are going to start with Introduction to Book-keeping and Accountancy. Let’s see what is there in this particular subject. So, first of all, basic accounting terminologies. Now there could be questions on terminologies, as define or explain or write a short note on some particular terms. So, from that point of view, this part is important to us, that is what I am talking about, examination of view. But not only that to understand this new subject, you must understand these particular terms, they are important terms. So far this subject is concerned and so that we must understand this particular subject minutely. So, let’s start with these particular accounting terminologies. Now, the very first term that is module no.1.1, chapter number 1 and module number 1, here we are going to discuss the term business. So, let’s see accounting terminologies and the very first term is business, so, on this there could be a question. What is business or write a short note on business. So, let’s see what is business? Business includes any activity continuously carried on by a person or persons and when conducting these particular activities that is intention is to earn profit. So to earn a profit when any kind of economic activity is conducted with an intention to earn profit and that activity is called as business. Let’s see further, now as example, production of goods, now goods are produced. Whenever the producer is producing the goods, why he is producing? Because he wants to sell them, so for the purpose of selling it he is making the production. And this production process is a continuous process, so in this factory they are producing and this product will be sold out in the market. And so this is one type of business which is known as manufacturing business. So, manufacturing of goods continuously for the sale to earn profit that is the business. Then we will see another example, buying and selling of goods. So, now here goods are purchased and sold. They are bought and sold and from that businessman is earning a profit. So, buying and selling of goods continuously to earn profit, again it is a business. Let’s see next example, providing services. Every time it is not necessary that we are manufacturing something or we are buying or selling only, so sometimes certain businesses, they are providing services. Now, providing services through couriers and then after that this another type of service wherein we are providing the information as per requirement of the customer and if this particular activity is continuously carried on then that is called as business. So, providing different types of services regularly to earn profit again it is a business. Thus, from this we can understand business is an economic activity. Second feature, we can say that it is continuous activity. So, if any activity is conducted once or twice, even if the intention is to earn profit then it cannot be called as business. So business is continuous activity, so it is continuous activity with intention to earn profit, requires different types of resources like men, machinery, material, money. So all these factors are bought together and with this help of these, the business activity is conducted. Then after that next intention is to earn profit, yes, that is very much essential to call it as a business, there must be intention to earn profit. So, these particular activities they are called as business. Check our next module, it is 1.16 and that covers profit, loss and operating profit. Let’s understand profit, what is profit? Or write a short note on profit. Yes, now this is see-saw, let’s speak on this basis of this particular see-saw. On one side incomes are given, on the other side expenses are given. So, obviously incomes are more than expenses that means incomes are more. So, when incomes are more than expenses, it is profit. So, profit is excess of income for a particular period over expenses of such period. So, when income is more and expenses are less, so the difference is called as profit. So, profit is equal to we can calculate incomes and gains minus expenses and losses. Such profit can either be withdrawn by the proprietor for meeting his personal expenses or can be retained in the business in the form of reserves. So profit can be taken away by the proprietor for his own use or he can retain that particular profit in the business and if it is retained that is reserved. Now, such unwithdrawn profit retained in the business are reserves, it increases net worth that is owner’s equity of the proprietor. Now, owner’s equity you have already seen that is owner’s fund in the business, so that it can increased because of reserves. Then opposite term loss, what is loss? Or short note on loss. So again that see-saw is there, now you can understand very easily here with this help see-saw. What will happen here, in this case now it is loss. I told you it is opposite term to profit, so obviously here expenses are more than income. So expenses are more than the differences are called as loss. Let’s see it is excess of expenses for a particular period over income of such period. Means expenses are more then in that case it is loss. See further, net loss is equal to so we have made the equation, expenses and losses minus incomes and gains. Such a loss of business it decreases net worth that is owner’s equity of the proprietor. Then, after that next term is operating profit. What is operating profit? Or write short note on operating profit. Gross profit is excess of sales than cost of goods sold. What is cost of goods sold? COGS, it is total of expenses incurred till the goods are bought to the selling condition. So, we can say gross profit is equal to sales minus cost of goods sold that is very commonly termed as COGS. Now, operating profit is excess of gross profit over all expenses of the business. All expenses of business. Other expenses means expenses other than COGS. So other than COGS whatever expenses are there they are other expenses. All other expenses known as, operating cost which includes office and admin expenses, selling and distribution expenses and financial expenses. We can make the equation, operating profit equal to gross profit minus other expenses.